37" x 16" x 8"
The female nature spirit associated with fertility and the Earth takes many forms in the Bwa culture-fish, birds, and bats are examples. Bwa masks are characterized by concentric circles around the eyes and a strong geometric motif of stripes, triangles and zigzags. 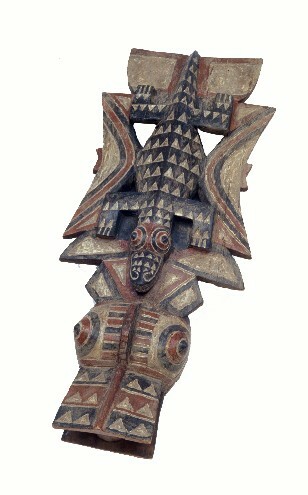 The crest mask shown here depicts a mother crocodile and her young. It is a poetic response to the purpose of the mask in a dance to celebrate life, renew the forces of nature and thank the spirits for nature's largess. The dance occurs on several occasions such as market days, initiations, funerals, harvest rites, and festivals.